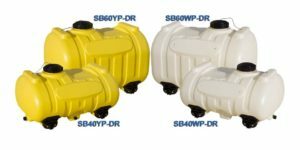 Spot Sprayer Tanks are designed as portable applicator supply tanks and are equipped with pump and equipment mount inserts. Tanks are equipped with molded-in legs to support the tank and band locators for tie down. Tanks mount with bottom inserts. All tanks are available with drain out sumps. Tanks are manufactured from linear low-density polyethylene with U.V. inhibitors and designed for containment of liquids of up to 1.7 specific gravity. Tank walls are translucent for level viewing and equipped with gallon indicators.